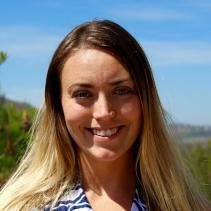 Andrea Miller serves San Diego Zoo Global as a Senior Research Associate in Community Engagement. In this role, she works to engage students and teachers in learning experiences aimed at fostering a connection to the natural world and a strong understanding of the science of saving species. She is involved in the development and implementation of relevant, hands-on conservation modules for students and teachers in the Conservation Education Lab, as well as our Teacher Workshops in Conservation Science. She also works to create conservation science kits for teachers across the nation to connect their students to research taking place at the Institute. Andrea’s efforts include revising our conservation education modules to more deeply engage visitors in learning about current Institute projects and foster an in-depth understanding of 21st century conservation issues. She ensures that the most updated information is used on tours of the Beckman Center about the work currently being conducted at the Institute and around the world. Andrea earned her bachelor’s degree in Biological Sciences from University of Alaska, Fairbanks, where her undergraduate research focused on a behavioral and nutritional study of wild muskoxen and reindeer. Andrea earned her master's degree in Zoology through the Advanced Inquiry Program, with a focus on engaging local and global communities in Southeast Asian tropical rainforest conservation. Living and working in Southeast Asia on orangutan conservation projects taught Andrea that in order to have successful conservation, we must work to bridge the gap between science and human communities.